The dam of 2018 Oaks winner Forever Together was purchased at the Tattersalls February Sale for 20,000 guineas. 464 lots have been catalogued for the two-day Tattersalls February Sale which takes place Thursday 31st January - Friday 1st February and features the ever popular TBA Stallion Parade commencing before the start of the sale on Thursday 31st January. The catalogue for the Tattersalls February Sale can be viewed online at www.tattersalls.com and will be published on Wednesday 16th January. Comprising 176 fillies in/out of training, 41 broodmares, 174 colts/geldings in/out of training, 53 yearlings and 20 two-year-olds, the catalogue features high class consignments from many of the world’s leading owner breeders including Godolphin, Juddmonte Farms and Shadwell Estates, who have 59 lots catalogued between them. The largest consignment is the team of 43 coming from Godolphin, with 10 fillies in/out of training catalogued on the first day of the sale followed by 33 colts and geldings on the second and final day. 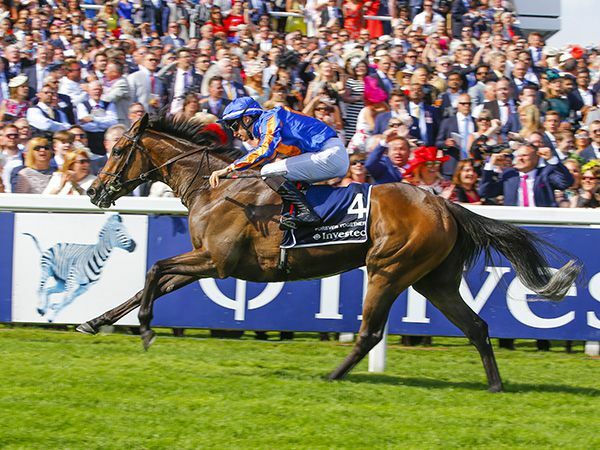 Eye-catchers amongst the draft include 2017 Royal Ascot winner ATTY PERSSE, Irish Listed winner AMBASSADORIAL and the Listed placed GRAFFITI MASTER as well as regally bred fillies by top sires DUBAWI, INVINCIBLE SPIRIT and NEW APPROACH. Other well bred fillies in training include the very smart 2018 Italian 1000 Guineas winner ACT OF WAR who will be consigned from Marco Botti’s Prestige Place, the Listed winning, Classic placed SLADINA coming from The Castlebridge Consignment, Highclere Stud’s Listed placed KODIAC filly SNAZZY, from the outstanding family of CASSANDRA GO, RHODODRENDON, MAGICAL and PHOTO CALL and the Group 3 placed HOLY ROMAN EMPEROR filly ELLERY LANE coming from Baroda and Colbinstown Studs. GRACEFUL, NORTHEAST MOON and QUEEN OF PARIS, half sisters to Group 1 winners GILT EDGE GIRL, PRINCE BISHOP and DARIANA respectively, as well as BUBBLY, the four year old half sister to MARLINKA, the dam of European record breaker MARSHA, are amongst a host of other fillies with obvious appeal. The seven strong team from Baroda and Colbinstown Studs also features the very smart RAINBOW QUEST mare KALANDARA, already the dam of multiple Group 3 winner LUMNATE, who sold for 900,000 guineas at the 2018 Tattersalls December Sale, in foal to LOPE DE VEGA, as well as the well bred MEDICEAN mare ART OF DANCE in foal to 2018 Champion first crop sire NO NAY NEVER. The young Listed placed mare HESTIA, also in foal to NO NAY NEVER, comes from The National Stud, while mares in foal to proven sires CITYSCAPE, DABIRSIM, HAVANA GOLD, HELMET, NATHANIEL, OLYMPIC GLORY, PEDRO THE GREAT, RAVEN’S PASS and ROCK OF GIBRALTAR all look likely to attract attention. Pinhookers also look well catered for with yearlings catalogued by proven Group 1 sires including CAMELOT, FAST COMPANY, HELMET, HOLY ROMAN EMPEROR, NATHANIEL, NAYEF, RULER OF THE WORLD and SHOWCASING as well as by first crop sires ADAAY, AJAYA, BELARDO, BURATINO, COULSTY, EAGLE TOP, MARKAZ, OUTSTRIP, PEARL SECRET, PRINCE OF LIR, PROCONSUL and TERRITORIES. Buyers looking for three year old colts in training with smart recent form also have plenty to choose from. Amongst the potential stars are the Martyn Meade trained CRACKLING, a very impressive winner of his debut on the final day of 2018, the consistent Hugo Palmer trained three time winner JAMES STREET, the 96 rated sprinter DEPUTISE coming from the stable of William Haggas, the improving John Gosden trained 2019 winner REETH and Joseph O’Brien’s recent Dundalk maiden winner ROGER THAT. The February Sale will commence immediately after the TBA Stallion Parade which begins at 11.00am on Thursday 31st January and the sale will start at 10.00am on Friday 1st February.